But while there is a clear need for balancing decentralised solutions with traditional large-scale infrastructure projects, not one project from the sub-national level has been included on the final shortlist. We look at three reasons why this might be the case – and three steps that could help remedy the situation. Thirty-seven funding proposals were submitted in total, eight of which have been submitted to the GCF Board for approval (see table below). They cover a wide range of projects and programmes, including large-scale projects from the private sector (Acumen has proposed a regional venture fund, for example) and proposals from multilateral bodies (the Inter-American Development Bank has put forward a proposal for energy efficiency bonds). 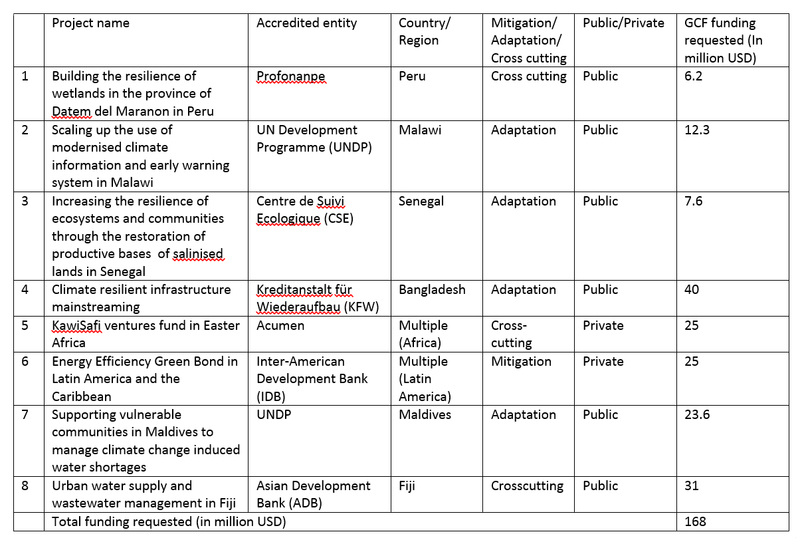 There are also infrastructure proposals from the Asian Development Bank in Fiji and the German development bank, Kreditanstalt für Wiederaufbau (KFW), in Bangladesh and proposals submitted by "national implementing entities" (NIE), (such as Profonanpe in Peru and the Senegalese agency, Centre de Suivi Ecologique). While more than 80 per cent of the projects are located within Least Developed Countries (LDCs), Small Island States (SIDs) or in African countries, with proposals from the national, regional and international levels, there are none from the local level. Sub-national entities once again remain on the decision-making fringe. The table below lists funding proposals submitted to the GCF board (click on the image to enlarge it). Why proposals from local entities are missing? Experience shows that there is a clear gap between international funding and decentralised, bottom-up climate solutions. While some local funds, such as the County Adaptation Fund in Kenya and the Urban Poor Funds, have shown that involving local people and local governments can bring more equitable and sustainable outcomes, closest to those most vulnerable to climate change. Choice of intermediaries and their technology track records incentivise 'business-as-usual' pipeline investments. The selected projects show that the GCF is prioritising multilateral bodies and existing partnerships which have a track record. This is leading to the selection of 'business as usual'-style infrastructure projects. For example, KFW has previously worked with Bangladesh's Local Government Engineering Department to invest in coastal infrastructure, and the Asian Development Bank has for many decades had a track record of water and sanitation infrastructure investments. Very few existing partnerships are with sub-national entities and therefore they remain on the decision-making fringe. Rumours that big banking houses (such as HSBC) will be accredited at the upcoming board meeting is further likely to isolate local community-based proposals. Sub-national entities have limited capacity to develop pipeline projects. Across the developing world sub-national entities often lack capacity, knowledge and any experience of putting together fundable proposals. As a result, even NIEs are often unable to secure adequate funding for sub-national bodies. The GCF's investment criteria disincentivises proposals from small-scale sub-national entities. The fund expects to finance proposals that are bankable and assure some level of economic efficiency. Local level and community-based adaptation projects often fail to fulfil such investment criteria. Accredit 'inclusive' intermediaries. To ensure local needs are prioritised, the GCF could incentivise national intermediaries that have a track record of reaching out to communities and which prioritise social development over growth. In many countries, for example, international and domestic development finance tends to flow to centralised government ministries such as those responsible for infrastructure and energy. Such ministries often take a 'one-size-fits-all' approach across the entire country. Marginalised communities therefore rarely have a say in how the money is spent. Social development, education and health ministries also have different roles to play in fostering resilience to climatic shocks among the poorest, and they often have strong relations with communities and civil society groups. However, these institutions often lack knowledge of and access to large-scale international climate finance. By addressing these gaps, and channelling finance through these ministries and local departments, governments and donors can help ensure the poorest communities benefit. Infrastructure Development Company Limited is a financial intermediary that invests in and represents the priorities of local people in decentralised communities in Bangladesh. The National Disaster Management Authority in Kenya also plays a crucial role in representing county-level interests in national climate finance decision-making. Develop sub-national bodies as executing entities. "Readiness support" (money to help countries set up the systems they need to access, manage and use its finance effectively) from the GCF can help countries to nurture local agencies to become executing entities. With capacity support, sub-national entities could develop fundable pipeline proposals. This should include a range of different bodies, not just those with previous experience, to ensure a wide representation of project priorities. Kenya's County Adaptation Fund has set an example, building capacity to empower devolved decision-making. This has encouraged project proposals that represent bottom up interests. The funding model satisfies various fiduciary standards and safeguards through institutionalised County Adaptation Planning Committees and Ward Adaptation Planning Committees. This approach is now also being tested at sub-national level in other countries such Tanzania. The GCF investment framework could prioritise social development criteria over economic efficiency criteria. The GCF's investment framework assesses project proposals based on qualitative explanations of how the project meets investment criteria. The board could consider ways to prioritise social development criteria over economic efficiency, particularly for local adaptation projects that are less bankable than energy efficiency bonds.